The assault to the European Champions of Olympiacos is fruitless: Olimpia chased basically during all game but never found the rhytm to control the tempo, penalized also by a dramatic foul situations especially with the bigs. Fotsis committed two early fouls and was confined to the benach, then Melli and finally Bourousis had the very same problem. When coach Scariolo could return to a regular rotation in the second half, the game was firmly in Olympiacos’ hands and Fotsis could’t get into any rhytm. It’s the third straight loss in Euroleague, the second at home: at midpoint in the regular season, the record drops down to 2-3 and with three games still to be played on the road, Olimpia will have to get a road win among Istanbul, Vitoria and Piraeus. The game finished 71-84. FIRST HALF – Vassilis Spanoulis is hot from the beginning. Everything in Olympiacos is generated by his drives and his ability to create from the dribble. He scores five of the first seven Olympiacos points opening the first consistent lead, 13-6 after 4 minutes. Coach Scariolo avoided the early time-out and send to the court Gentile and Melli. The defense is improving and the offense pounds the ball inside to Ioannis Bourousis. The big man scores six cosnecutive points, it’s a 6-0 run and the first lead is stopped. Olimpia is trying to get away, after a three-point play by Richard Hendrix and a Langford’s dirve. But a couple of turnovers and the penalty sending Olympiacos to the line seven times in the first period allows the Greeks to open up another seven-point lead, 17-24 in the first. Olimpia starts the seconds pounding again the ball inside to Bourousis: Ioannis responds with a three-point play and then two fouls drawn in post-up situations for three more points. When EA7 is down by one, 23-24, Pero Antic makes a huge three but Olimpia is still there: Cook ties up the score, Chiotti surpasses with a free throw. Olympiacos reacts again: Spanoulis drives, Papanikolau makes a three, Mantzaris makes two foul shots. Hairston stopped the run only for a moment with a long 2-pointer. Papanikolau makes another three and Printezis imitates him. Entering in the lat minute, it’s 30-40. Cook makes a three from the left corner and Hairston does the same on a Gentile’s assist. Olympiacos make a foul shot with Mavroeidis. it’s 36-42 at halftime. SECOND HALF – The start is a struggling one. Olympiacos places a 9-2 run immediately and it’s up by 12, 38-50. Bourousis tries to get Olimpia back in contention but he commits his third foul. Langford makes a three-point play. But the Greeks are controlling the game anyway in the third holding Olimpia to nine points. It’s 50-59 entering the fourth but Fotsis, Melli and Bourousis are all playing with three fouls. A three-point play by Hairston is brining Olimpia within siex, 53-59. But it’s a just a moment. Spanoulis makes a three, Papanikolau does the same and EA7 is down again by 12, 55-67. 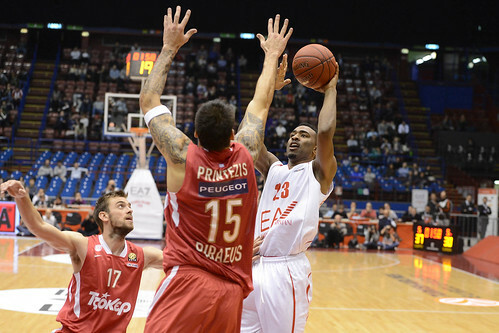 Olympiacos lead is getting bigger, 15 points with five minutes left before a Gentile’s drive. Langford gets in double figure with a three but just after Olympiacos went up by 17. Then at the end of the shot clock Papanikolasu makes a huge three ending effectively the game.